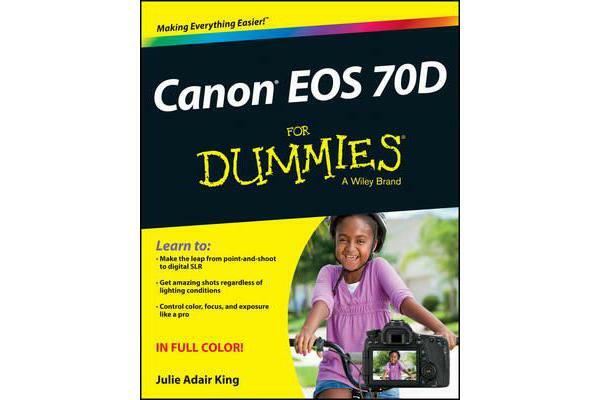 The Canon EOS 70D features upgraded focusing technology, a 20.2 megapixel sensor, and faster frame-per-second shooting. Whether you’re new to dSLR photography or just getting acquainted with the 70D, this handy, full-color guide will have you taking great photos before you know it. You’ll learn to use all the on-board controls, shoot in auto mode, use live view, control exposure and lighting, manipulate focus and color, transfer your images to the computer for editing, and share the results in prints or online. Colorful photos throughout illustrate what you can achieve. 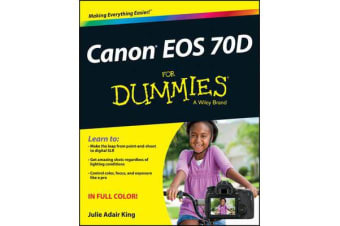 Upgraded features in the Canon EOS 70D include a new focusing technology that speeds up autofocus for video and live view shooting, a larger sensor, faster frame-by-frame shooting, and a wider ISO range This full-color guide explains how to take advantage of all the features; walks you through all the on-board controls, and shows how to shoot in auto mode Covers dSLR basics such as dialing in exposure and lighting controls, manipulating focus and color, and transferring your images from the camera to the computer Offers advice for shooting in various common situations and explains how to post your photos online, make prints, or share them in other ways Canon EOS 70D For Dummies makes it easy to get terrific photos with your Canon dSLR camera.